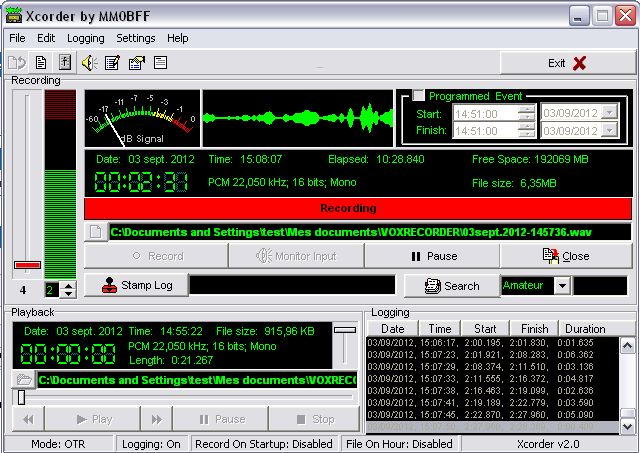 Xcorder is a windows Freeware sound recorder written byÂ MM0BFF,Â intended to work mainly with radio receivers but may be used also in several different ways. Main feature of this free software is the ability to start recording only when a signal input is detected, so that it will not record during pauses or when only carrier is detected, saving a lot of space in your hard drives. Best results are achieved by recording on VHF UHF bands signals since here the Squelch work better, and can correctly trigger the recording on. This does not mean that you cannot record on HF bands but for sure it will require mode fine tuning on Squelching and however this will not solve the QRN peaks to activate unwanted transmissions. This program looks like what I am looking for. See my recent YouTube video about recording off HF with time stamping. My channel is hamrad88 and one of my subscribers sent me to your website. I am just learning how to use this program. I have a problem right off the bat, when I playback a recording, I have no audio but when I move the volume slider up the sound is there but the slider will not stay set, over a few seconds it slides back down. Any help will be appreciated. Im having trouble with the playback volume. the volume slider continually slides to 0 volume. very frustrating am i missing somthing or is this a bug. Every time my computer restarts I have to recheck the “Record in Startup”, “Create new file every hour”, and turn logging off. Why is the program not saving my options? I can the program via shortcut in windows Startup menu, it would be nice to have it automatically start and with the hourly recordings.